The Rwandan Orphans Project is a registered charity in the USA as well as in the United Kingdom. ROP’s Imizi Children’s Center is registered with the Rwandan government with the National Children’s Council, the Ministry of Gender and Family Promotion and the Ministry of Education. 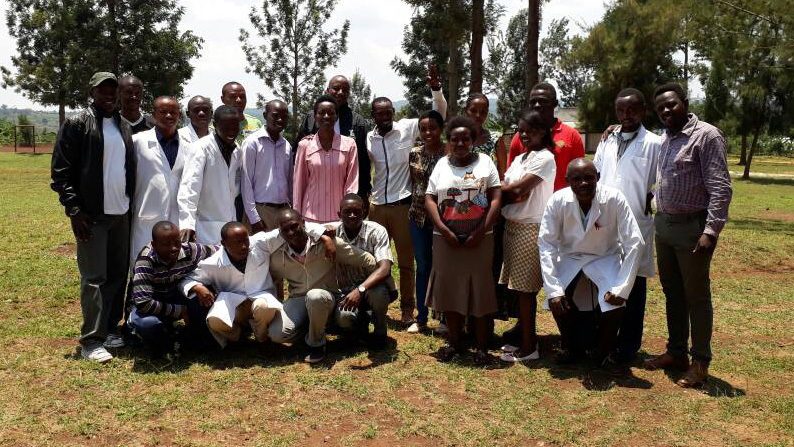 The success of ROP’s Imizi Children’s Center begins and ends with our amazing staff in Rwanda. These teachers, social workers, caretakers and support staff not only do incredible work, but they also act as parents, mentors, friends and advocates to the boys and girls who benefit from our programs each and every day. Our staff are at the very core of ROP’s mission and vision, and we are grateful each and every day for the hard work, commitment and compassion they show to all of those who seek and receive help at the Imizi Children’s Center. Kim graduated from UCLA in Accounting and Economics and is a tax accountant who learned about ROP through local work in San Diego. Once hearing more about the children in Rwanda, Kim wanted to be more involved in their growth and development. Kim was elected as a Board member in 2013 and served as board treasurer until being elected as president in 2017. Sean began with ROP as a volunteer in mid 2009. He traveled to Rwanda to assist the center in January 2010 and soon took over the day to day management of the program. In 2012 he was asked to be the Executive Director of the organization. He was invited to join the board of directors in 2009. Jenny was a journalist from the UK who moved to Rwanda in early 2010 and began working with the ROP a few months later. She worked at the Imizi Children's Center in Rwanda until 2015, while also working as the Reuters correspondent for Rwanda. She was elected as a board member for the US board in 2011 and registered the ROP as a charity in the UK in 2014. She is currently serving as Chair for the ROP UK. Martha graduated with a Bachelor of Arts in Economics and Accounting from the University of California, Santa Barbara and is a licensed CPA in California. After assisting with the accounting and fundraising for the organization, Martha was eager to become more involved and was invited to join the board of directors in 2019. Amanda graduated from California State University, Fullerton with a bachelors in Business Administration and is currently a Human Resources Manager in San Diego. After volunteering for many ROP fundraisers, Amanda was compelled to be more involved in the organization. David Chaney is licensed CPA from the state of Texas. He has 20 years of experience in public accounting and manages a solo practice In Houston, TX with over 200 clients. He has been periodically teaching and working in Rwanda since 2010 and is also on the board of another Rwandan NGO which benefits survivors of the 1994 genocide. David began as a donor to ROP in 2011, and was invited to join the board in 2016. Beth has worked as a Special Education teacher in the San Diego Unified School District since 1999. She has a BA in psychology from the University of California, Berkeley. She also has a Multiple Subject teaching credential, as well as an Educational Specialist credential. Her father, James Hall, is a founding member of ROP. Beth has been to Rwanda several times and has been a donor since 2012. She became a board member in 2016 and was board secretary in 2018. Beth is devoted to the health and growth of the children of Rwanda and the ROP organization. Ron is a retired OB/GYN who practiced at Kaiser in San Diego for many years. During his full time practice he made trips to Honduras, Lithuania, Russia, Ghana, Mexico, and Congo, working with those in need and teaching. His first visit to Rwanda was in 2005 and seeing the homeless children in the streets left a profound effect on him. He has committed himself to helping them through the ROP ever since. Ron served as the ROP president from 2011 until 2016. When JoAnn returned from a group trip to Kigali in 2006 to research the original orphanage she knew that she wanted to be part of the group helping these street children. When the ROP was founded she agreed to serve as Treasurer and Accountant, which she did for many years. Robert has over 35 years of experience in the financial services industry and has an expertise in wealth management. Robert and his family have been supporting the ROP in many aspects including fundraising, organizing events and bringing greater awareness to the ROP cause. His leadership skills and eye for detail led him to be invited to the ROP board of directors in 2014. Steve is an accomplished engineer, businessman and financial trader. He first began working with us in 2010 while working with Engineers Without Borders as a professional mentor for University of Colorado engineering students who had taken on a project to design new facilities for the ROP. After that project had ended Steve continued supporting the organization and in January 2018 he was formally invited to join our board of directors. Anna is a social worker in London, working with children and young people in care. In 2011 and 2015 she spent a month in Kigali working alongside ROP in the Imizi Children's Centre. She was particularly inspired by the impact the staff had on supporting children's complex emotional needs, creating a safe and fun place for the boys to grow. Anna has been on the UK board since 2014 and currently serves as secretary. Ralph has been working as a quantitative trader based in London ever since graduating with a Mathematics degree from Cambridge University. He was elected as a board member in 2017 and currently serves as treasurer for the ROP UK. Clare is a lawyer based in London. After spending several years working in Asia Pacific she took a sabbatical in 2013 as part of her return to the UK, during which time she spent a month in Rwanda. It was then that she found out about ROP and was so impressed with the work of the Imizi Children’s Centre and the impact it had on the children’s lives that she stayed involved on her return to the UK. Clare was elected to the UK board in 2016.